After reading our tweets asking for people to share their World War One memories with us we’re pleased to share this new story with you all – and again to ask for your help. 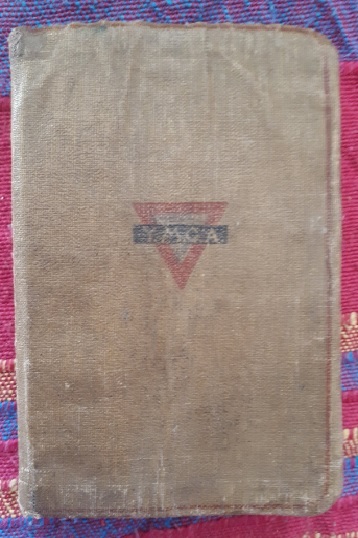 I recently discovered my Great Grandfather’s bible in a drawer and this made me want to learn more about him, for he died aged 29 in 1917. At this point all I knew about him was that he left behind a widow (my great-grandmother) and two children – my Nan and her brother. After some encouragement on Twitter I started to some more research and very quickly the internet turned up some amazing information! Simple research on the Commonwealth War Graves Website has confirmed that Pte John Wells of the 8th Bn Norfolk Regiment died on 11th August 1917, during what would become known as the 3rd Battle of Ypres. I’ve also discovered that he has no known grave but is commemorated on the Menin Gate, the thoroughness of the War Graves Website lists exactly where to find him (Bay 4 Stone K) and an image of exactly how that stone is laid out. There is also a beautiful certificate to download commemorating him. 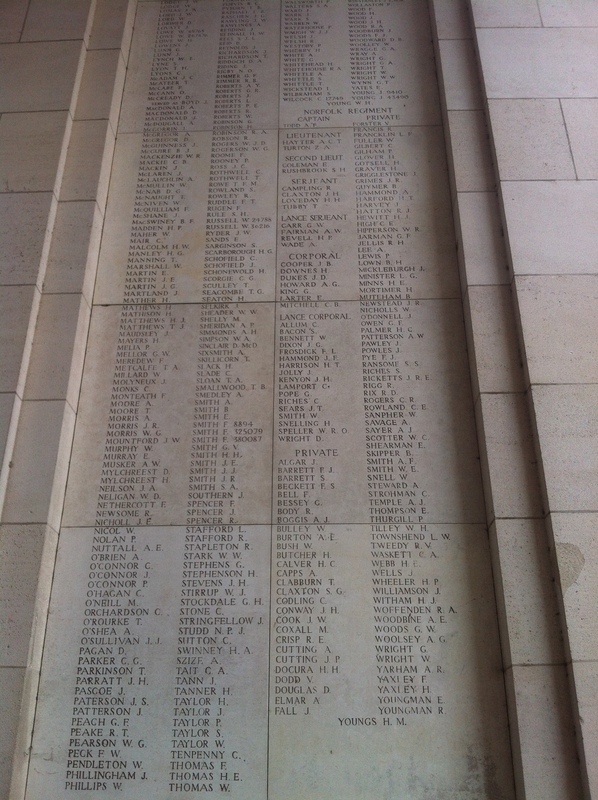 Historian and Battlefield Guide Steve Smith provided this photo of the panel on the Gate too. 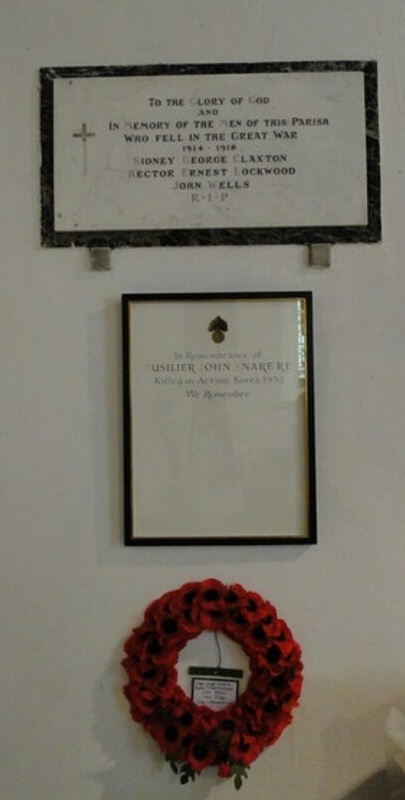 As well as being commemorated in Ypres, John is also commemorated in Santon Downham church where he is one of three men from the area not to return from the war. Some more investigation online lead me to the Brandon Remembers website where for the first time I learned more about his life. The full details can be read on the website but I was interested to see that he initially signed up in 1915 but was placed as a Reserve at this point. From the time he arrived in France he seems to have had an unlucky war with a lot of illness and injury prior to taking part, and dying during the 3rd Battle of Ypres. Whilst looking into John Wells I was astonished to discover that he also had a brother, Samuel – a relative I had no idea existed. Thanks to the Brandon Remembers website again I now know about his war, and sadly it is no happier than John’s. Samuel was a career soldier who served with the 2nd Bn Norfolk Regiment. At the outbreak of war he was in India but then posted to Mesopotamia. He was taken ill there in 1915 and evacuated back to India but sadly he too died. 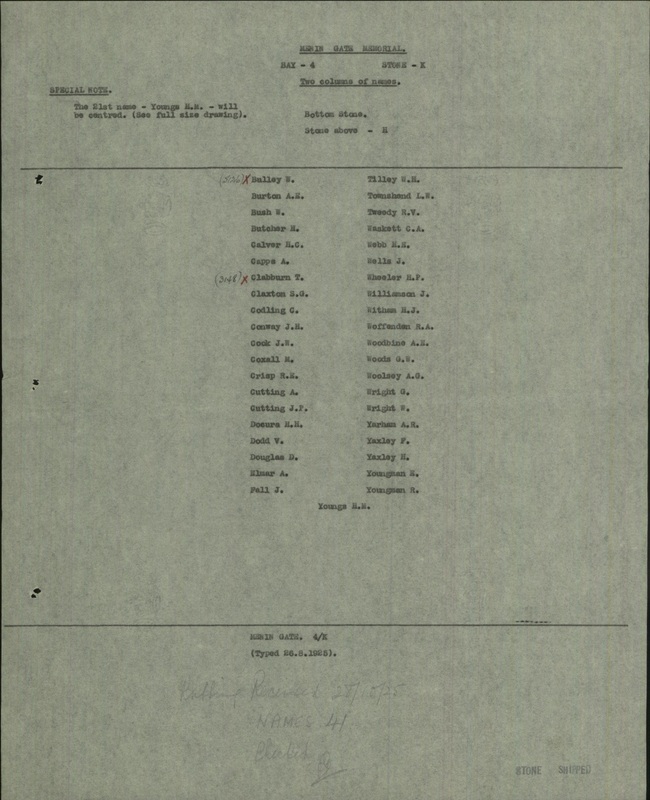 Incredibly I have also found a third son, Arthur, who also served with the Norfolk Regiment during the First World War but preliminary research has shown him as having survived – right through until 1973 in fact. I can’t imagine how my Great Great -Grandmother felt losing her two of her sons, and also John’s wife being left a widow with two small children. While I now know so much more about these relatives I would love to know what they look like and if anyone has any photos that might include either Samuel or John Wells I would be very grateful if they could be shared with me. 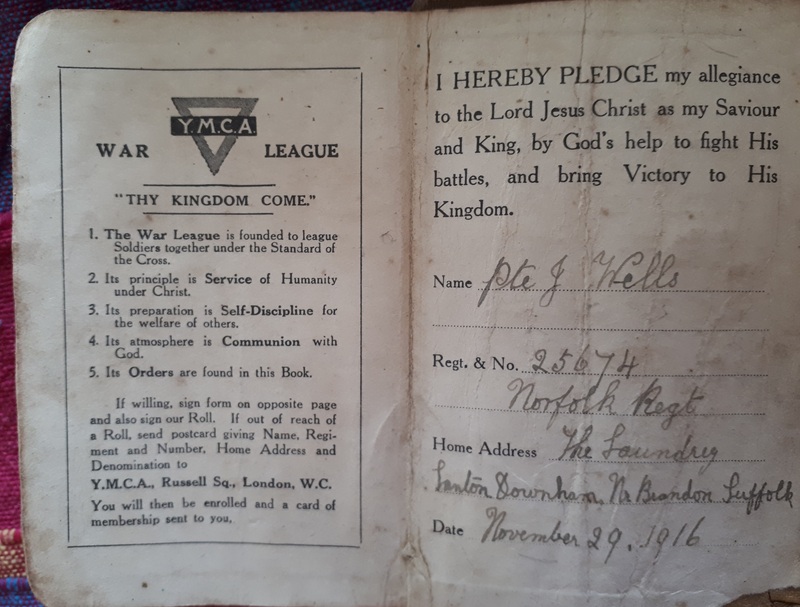 This entry was posted in Family Reminiscence, Information needed and tagged brothers at war, Mesopotamia, Norfolk Regiment, Santon Downham, Third Battle of Ypres. Bookmark the permalink.